4:00 pm Hot Yang/Yin Yoga (75 minutes): Chris O. 4:00 pm Hot Power Flow (75 minutes): Laura K.
4:00 pm Hot Yoga (75 minutes): Chris O. 6:00 pm Yoga Boot Camp Hour: Chris O. 8:00 pm Hot Barkan Hour: Lori D.
9:30 am Hot Vinyasa (75 minutes): Chris O. 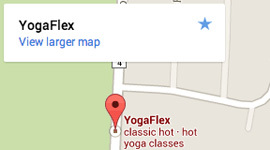 4:00 pm Hot Yoga Hour: Laura K.